We provide informational training and other learning opportunities for consumers, family members, attorneys and others who support people in the disability community. 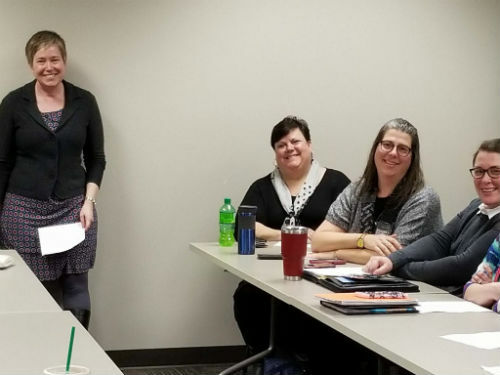 Disability Rights trainers offer effective strategies to strengthen individual advocacy skills, improve the system’s response to issues of access, broaden the understanding of disability rights and more. Please contact us to ask about accommodations and accessibility requests for our trainings. Our trainings are free for people with disabilities and their families. The cost for trainings we do for professionals, businesses and other organizations, is based on a fee-for-service scale. If you would like to attend one of our upcoming trainings, check out the events on our home page. If you would like toto request an in-person training for your group, you can fill out the training request form on the right side of this page, or contact us to schedule a training. Below, we’ve provided examples of some of our training topics. We’ve also provided a description of the goals we hope to accomplish with each training. Advance Directives: You’ve Got the Power! If you would like to request a training, please complete this form and one of our staff members will get back to you soon.